Olhos de Água, picturesquely located on the coast of the Algarve between Albufeira and Vilamoura, belongs to the parish (freguesia) of Albufeira e Olhos d’Água. The name, meaning “eyes of water”, is derived from the sweet water springs rising on the beach and under the surface of the sea. It is thought that because of these springs the area around Olhos de Água was populated by Phoenicians and Carthaginians, and salt pans dating from the Roman times have been found. 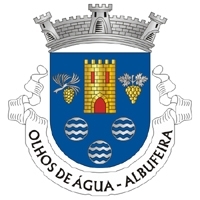 Until the 1960s Olhos de Água was a small fishing village. Due to the rapid development of the mass tourism it is now a very busy place during the summer season. Today hotels, holiday villas and apartments stretch along the entire coast reaching the outskirts of Albufeira. East of Olhos de Água on the border with Vilamoura, you find one of the greatest golf and holiday resorts in Portugal, Pine Cliffs. The resort built on a cliff top comprises the 5star hotel Sheraton Algarve, several luxurious apartment complexes, a 9hole golf course and many sports and leisure facilities for an unforgettable holiday stay. It is also very popular for international business events.